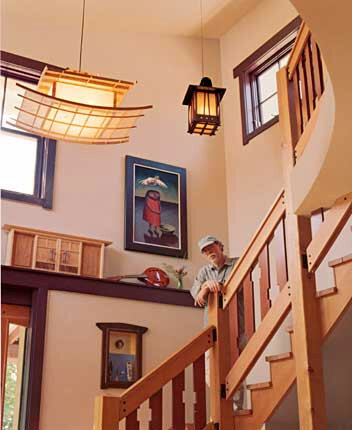 Jim McCarthy creates fine furniture inspired by the California Arts and Crafts movement and Asian design. His works range from single pieces of furniture, to custom woodworking and cabinetry in historic homes, to light fixtures and musical instruments. His distinctive style illustrates his love of wood by maximizing the color, texture and contrast of the materials. Often collaborating with his wife, painter Christine Brennan (FOTM Alumna 2001), the two live in a home they built that serves as a constant source of inspiration. McCarthy graduated from the University of California, Santa Barbara and received training in antique restoration at The Boston Museum of Fine Arts. Along with furniture making and design, music has always been a great passion of Jim’s. Attendees will have a special opportunity to see him with noted cellist Virginia Kron (FOTM Alumna 2010) perform one of Jim’s original compositions from his 2012 CD release, “Music Cabinet”. Jim was formally documented on May 13, 2014 and was sponsored by Paula Spellman.